— Where Are the Graves, and What Are They Like? Most are in the four provinces of northern and western Iraq where the Islamic State’s caliphate acted as the government: Anbar, Kirkuk, Salahuddin and Nineveh, which includes Mosul, the largest city once controlled by the extremists. They range from small burial sites with eight bodies, to massive pits believed to hold thousands. The biggest is believed to be the Khasfa Sinkhole near Mosul. 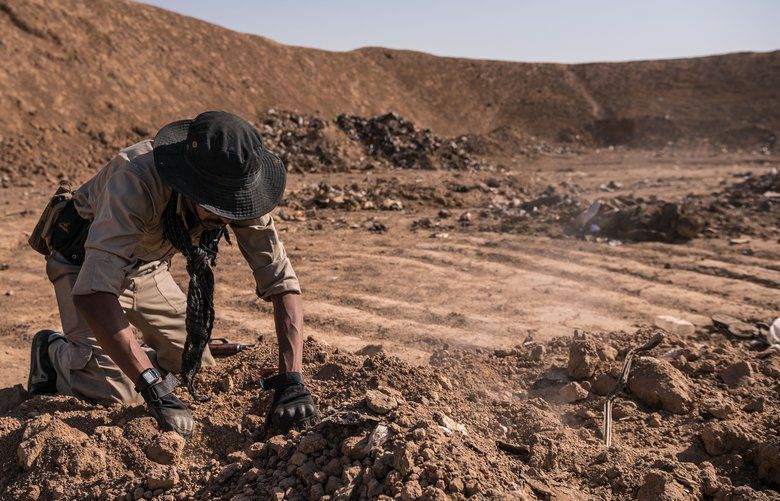 “I can only say that the number of the victims of the mass graves is much bigger than the numbers in the report,” said Dhia Kareem, head of the Mass Graves Directorate in Iraq. He said eyewitnesses estimated there were 6,000 bodies in the Khasfa Sinkhole. — Why Is This Discovery Important? While the extremists made no secret of their systematic violence, there has been little accountability for what they did. During its three-year rule, the Islamic State terrorized local residents, often releasing videos of executions of people targeted for government ties, sexual orientation and more. The militants also went after members of ethnic and religious minorities, including Christians and Yazidis. — What About the Families of Victims? The United Nations said it was likely that more mass graves would be discovered, which will only worsen the situation, especially for families of victims. Iraqi authorities have so far exhumed only 1,258 bodies from 28 sites, the United Nations said, because of a lack of government resources at the Mass Graves Directorate. The United Nations urged officials to identify the victims quickly and to return the bodies to relatives. But it also recognized that Iraqi authorities need more resources to make that happen, while preserving evidence of crimes, and it urged the international community to help out. The report also noted that Iraqi bureaucracy made it difficult for people to find missing relatives because information was not held in a centralized way. “Their families have the right to know what happened to their loved ones,” Bachelet said. — Do the Graves Add to What Is Known About the Scope of ISIS Killings in Iraq? It is too early to say. The United Nations has estimated that 30,000 civilians were killed by the Islamic State from 2014 to 2017 — “a number that should be considered an absolute minimum.” But many of those victims were found and buried by their families. That so many thousands are in the 202 mass graves identified so far is shocking — and only 28 of those graves have been thoroughly exhumed so far.